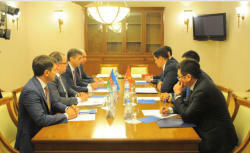 The accounts chambers of Azerbaijan and Kyrgyzstan have signed an agreement on bilateral cooperation, the Accounts Chamber of Kyrgyzstan said in a message on Sept. 6. 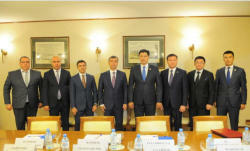 The document was signed in Moscow by heads of the highest audit agencies of the two countries - Vugar Gulmammadov and Ulukbek Maripov. During the meeting, Ulukbek Maripov stressed that the Accounts Chamber of Kyrgyzstan pays special attention to the establishment and development of bilateral cooperation with the Chamber of Accounts of Azerbaijan. Ulukbek Maripov expressed confidence that the norms stipulated in the agreement will work in favor of deepening and strengthening bilateral cooperation not only between the accounts chambers, but also between Kyrgyzstan and Azerbaijan as a whole.